Installation image. Light moves: contemporary Australian video art. Photo: Tobias Titz, RMIT Gallery, 2016. Installation image. Christian Thompson, 'Heat', (2010). Photo: Tobias Titz, RMIT Gallery, 2016. Installation image. Daniel Crooks, 'Pan No.9' (Douppelgänger), (2012). Photo: Tobias Titz, RMIT Gallery, 2016. Light moves presents projected and screen-based works by internationally recognised contemporary Australian artists which explore the body performing in a range of real and imagined spaces. 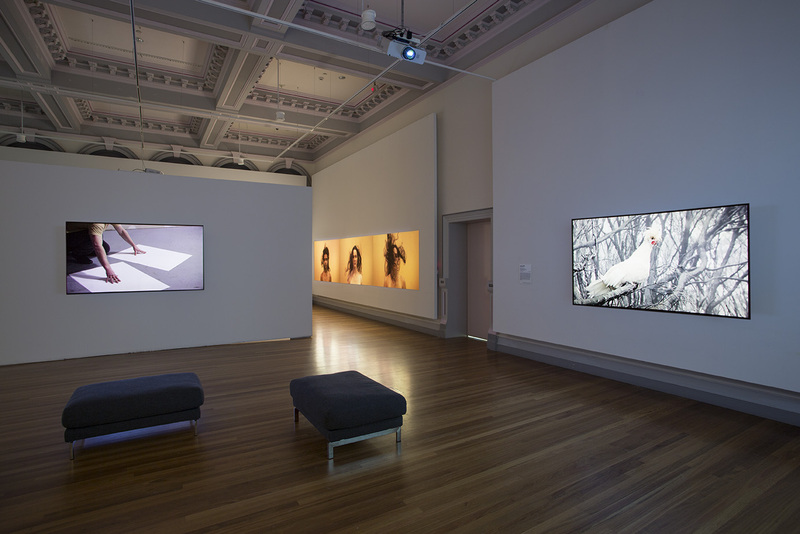 Drawing on work acquired over the last three years for the National Collection of Australia, the seven works featured in Light moves explore the possibilities of movement, in most cases the body moving in space, in contemporary video. Each is an example of contemporary storytelling, inviting viewers to think about the place and significance of real bodies in a contemporary world. A world which is increasingly digitised, where many interactions happen in virtual spaces and online. The exhibition is on tour from the National Gallery of Australia. New Zealand born Daniel Crooks is interested in the manipulation of time and space, taking small slivers of video sequences and stretching them across the frame, creating fluid, abstract fields of colour. He uses an array of stop-motion animation, time-lapse and precision camera motion control techniques to create his distinctive ‘time-slice’ imaging process which has slivers of images stretched and transformed into abstract amoebic forms. His work Pan no. 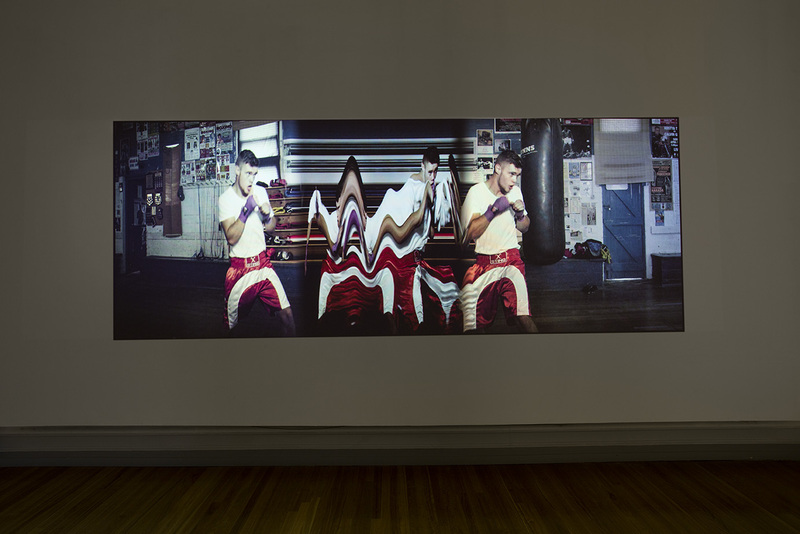 9 (Dopplegänger) 2012 is a large projected work showing an athletic young man shadowboxing in a gym, moving both toward and away from viewers. New Zealand born Hayden Fowler grew up observing animals on his grandparents’ farm and initially studied biology, focusing on animal behaviour. His work looks primarily at the suppressed emotions of loss that arise from our alienation from nature. New world order (from the series New romantic 2013) is a large projection where Fowler has painstakingly constructed elaborate sets in his studio and populated them with birds. Shaun Gladwell is a champion skateboarder and internationally successful Australian multimedia artist. The six monitors presenting his work Centred Pataphysical suite (2009) shows Gladwell and four other performers – each an expert in skateboarding, breakdancing, classical dancing, capoeira or BMX riding – revolving like a dervish around various still points and structures in urban settings. Gabriella and Silvana Mangano are sisters who undertook an International Studio and Curatorial Program residency in New York. In unfamiliar territory, but hugely symbolic as an art world capital, they set out to understand and become part of the city by walking the streets and gathering abandoned objects of different sizes, shapes and weights. The nine videos that make up Performance compositions for sculpture (1-9) show the objects manipulated by hands and limbs, with objects becoming elements of abstract composition. David Rosetzky’s works explore identity, subjectivity and relationships and bring together elements of theatre, film, performance art and dance. For Half Brother (2013), Rosetzky collaborated with renowned choreographer Jo Lloyd and well-known dancers Gideon Obarzanek (founder of the contemporary dance group Chunky Move) and two eminent members of the company, Alisdair Macindoe and Josh Mu. Julie Rrap has continually challenged societal norms about the body and gender, and asks questions about the place of women and women’s bodies in art history. Her work scape artist: castaway (2009), is a self-portrait where we see the artist in a physically challenging situation, entangled within overlapping planks of wood. The movement morphs from one pose to the next as the artist struggles within the wood that contains her. Christian Thompson is a member of the Bidjara people; his work focuses on the exploration of identity, sexuality, gender, race and memory. 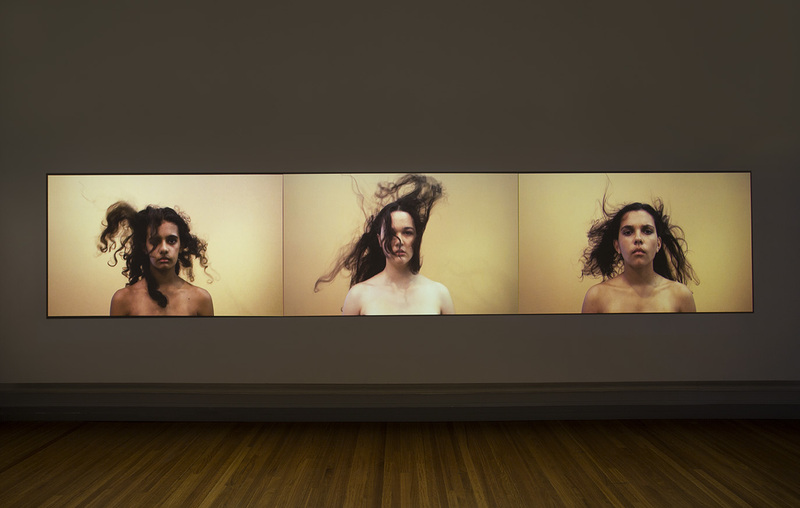 The warm, golden palette which provides the backdrop for Thompson’s video HEAT (2010) combines with the effect of wind to evoke the desert heat of the central areas of Queensland – especially Thompson’s father’s country, where he spent time in his youth.